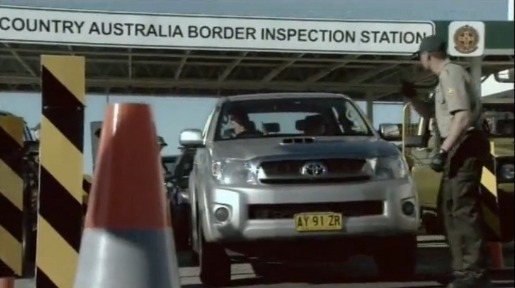 Toyota Australia is promoting the rural and workhorse 4WD range with “Australian 4WD Border Security”, a 2 minute television commercial in which “nothing soft gets in”. Launched during the AFL Grand Final on Saturday September 26, the spot will continue in a 60 second format. The ad is launched in conjunction with the fiftieth anniversary of the first Toyota sale in Australia, a batch of Landcruisers chosen for working on the Snowy Mountains Hydro-electric scheme. Toyota-driving border patrol men and women make it their mission to make sure that nothing soft gets into Country Australia, the hard country. Metrosexuals with pink shirts and upturned collars, latte sippers, tofu eaters, hairdryer users, manbag carriers and toy dogs are clearly not cut out for this place. We’re shown off roader urbanites who put fake Toyota badges on in the hope of getting through, despite their poor suspension and low clearance. Also see the 60 second version on YouTube. The Border Security campaign was developed at Saatchi & Saatchi Australia, Sydney, by executive creative director Steve Back, creative director Dave Bowman, art director Vince Lagana, copywriter Steve Jackson, account manager Amy Turnbull and agency producer Kate Whitfield. Filming was shot by Tim Bullock via Prodigy Films with producer Julianne Shelton, executive producer Jonathan Samway, director of photography Geoffrey Hall, and editor Adam Wills. Post production was done at FSM. Sound was produced Nylon Studios.